A modern dice game known as Bones is a lot like the game Yahtzee. Following a few simple steps will ensure that, when you're tired of playing craps, you have something to move on to. Roll one of the dice. Your friend should do the same. Whoever gets the highest roll is the first player to roll. Roll all five of the dice when your turn comes up. You must roll a 1, 5, or at least a three-of-a-kind on your first roll to continue rolling. If all of the dice come up the same number (such as rolling five 3s) then you get 10,000 points, which makes you the winner. The first player to get 10,000 wins, so rolling the same number on all five dice makes you the victor. Set aside your scoring dice (1s, 5s, three-of-a-kinds, four-of-a-kinds). Even rolling just one 1 or 5 ensures you can keep rolling. Roll the remaining dice. This, of course, is taking a chance. If you get no points on your next roll, then you lose all points from your previous roll. Many people would end their turn if they rolled a three-of-a-kind, or enough 1s and 5s. Continue setting your scoring dice aside until you want to end your turn. If you continue rolling and score with all five dice, mark down your score and roll all five dice again. Scoring with all five dice allows you to take another turn. Continue doing this until you end your turn, or until you roll a zero roll. Make sure you set a specific number for scoring. Many people set a minimum of 500 to score. This means you must roll at least 500 points to mark down the score. Therefore, if you are playing a 500 minimum, it would be pointless to end your turn before scoring at least 500. You can make this minimum any number you want, even just 50, although most would not end their turn after rolling only one 5, which is worth 50 points. Create a strategy. Your strategy should take into account that with three, four or five dice to roll, you have a good chance of scoring points. If you roll a three- or four-of-a-kind in your first roll, then you only have one or two dice left. 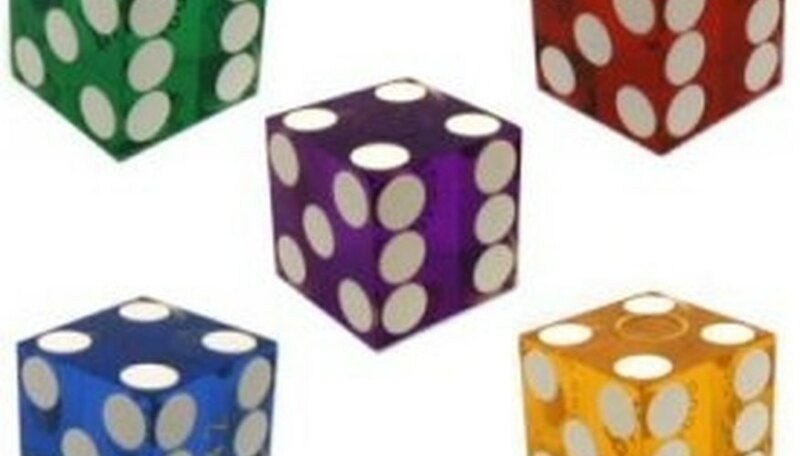 Rolling only one or two dice is taking a chance, as the odds of you rolling a 1 or 5 reduces as you have fewer dice. This also applies if you roll two 1s and two 5s at the same time. You get points for each of these dice, but you are only left with one die. Rolling that one die and hoping for a 1 or 5 is taking a serious chance that will often cause you to lose all of your points for that turn. Remember that if all five dice score, even on the first roll (such as three 1s, two 5s), then you record your score and roll all five dice again. Once you score with all five dice, you get to keep that score, even if you roll a zero with the five dice on your next round. Whenever you end your turn or roll zero, it is your friend's turn, and he plays by the same rules as you. First to 10,000 wins. Try adding your own variations to the game. This could include getting straights (1-5) or a type of full house (three of one number, two of another) and adding point value to them.